ADELPHI, Md. 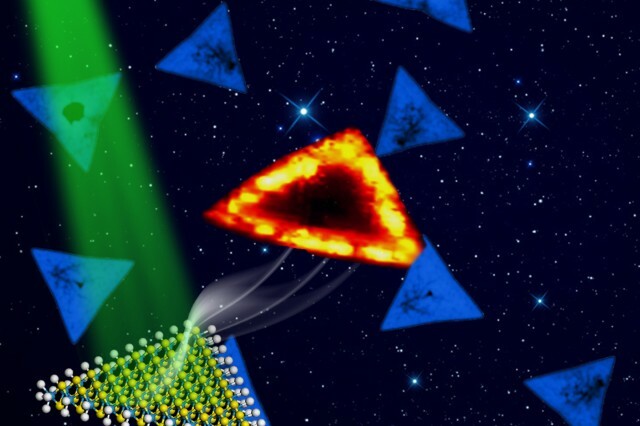 (April 9, 2013) -- Army scientists want to make sense of the fascinating properties of novel layered materials that can exist in a single or a few atom-thick layers, such as graphene. 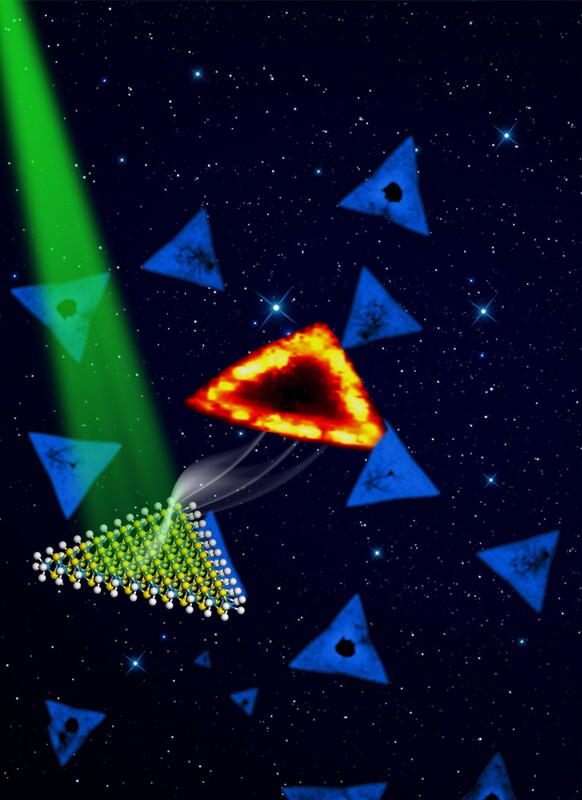 Recently Penn State researchers working with the Army Research Office showed that tungstenite, or WS2, formed from layers of sulfur and tungsten atoms has light-emmiting properties that cold be useful to plenty of Army applications, like optical sensors or even lasers. University scientists saw an extraordinary glow from the honeycomb edges of monolayered triangular islands of WS2 for the first time and knew this would be groundbreaking. The discovery was one of several milestones for a small team of experts from four universities working on a Multi-Disciplinary University Research Initiative, or MURI, project. Along with the principal investigator of this project, professor Pulickel Ajayan of Rice University, this team is helping the Army "make sense of the fascinating properties of novel layered materials that can exist in a single or a few atom-thick layers," said Pani Varanasi, Ph.D., program manager for the Physical Properties of Materials Materials Science Division of the U.S. Army Research Office, of U.S. Army Research Laboratory, known as ARL. The MURI project, which explores the synthesis routes of two-dimensional, or 2-D, atomic layers of nitrides, oxides and sulfides and characterization of these materials, is in its second year. "The most recent finding forms the building blocks for improvements to future Army technologies such as sensors, transistors and flexible displays," Varanasi explained. Mauricio Terrones, Ph.D., a professor of physics and of materials science and engineering at Penn State, is one of the team members of the MURI, and leads the present research on WS2 materials. "We wanted to work on a layered system that people were not working on already," Terrones said. "There were several reports on [molybdenum disulfide] but not that much research regarding WS2, so we thought this could be a nice avenue to investigate." The research team used a method similar to the one they developed in their earlier research. 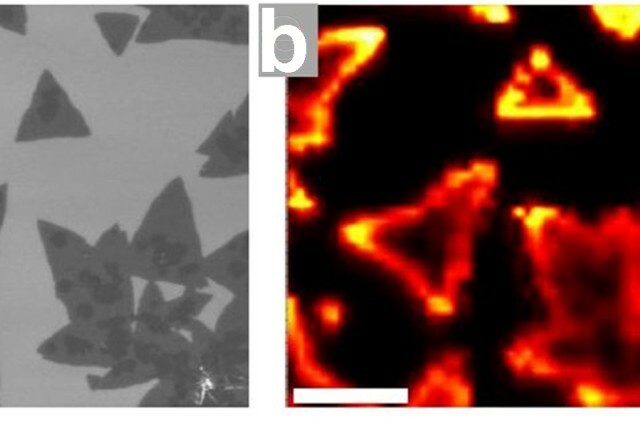 "We were investigating previously the synthesis of WS2 nanotubes using WOx nanorods and sulfur, therefore we thought thin films of WO3 would be appropriate to start producing 2-D materials," Terrones said. They deposited tiny crystals of tungsten oxide, less than one nanometer in height, and then passed the crystals through sulfur vapor at 850 degrees Celsius. It led to one-atom thick WS2 triangles, he said. 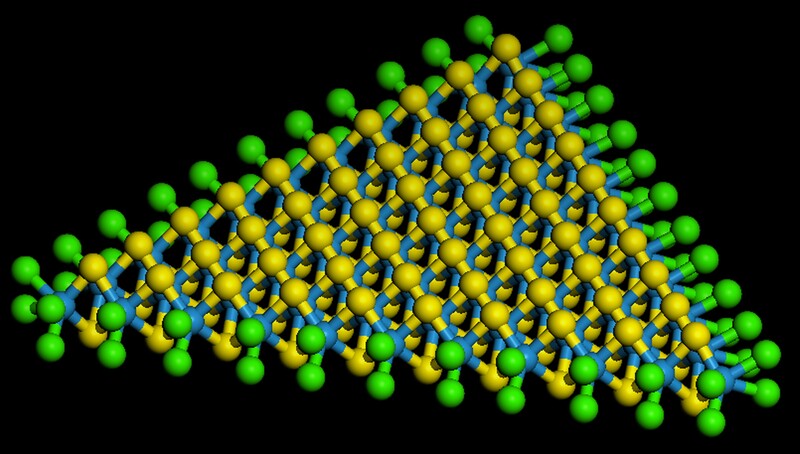 The idea was to grow monolayers of WS2 using the chemical vapor disposition approach, and then try the experiment with molybdenum disulfide, known as MoS2. The results for both minerals were similar, but instead of the uniform film they expected, they got triangular islands, Terrones said. What astounded them from the first experiment was the "extraordinary photoluminescence from the edges of the triangles at room temperature." Photoluminescence occurs when a substance absorbs light at one wavelength and re-emits that light at a different wavelength, like what happens in fireflies. In the future, the structures could have plenty of applications in optical detectors, light emitting diodes, photo sensors, and even in the development of lasers, Terrones explained. He explained that creating monolayers, or single, one-atom-thick sheets is of special interest to scientists because the chemical properties of minerals and other substances are known to change depending on their atomic thickness, paving the way for an infinite amount of possible materials. The preliminary results of the WS2 research will be published in a print edition of the journal Nano Letters, and will also appear on the cover of the forthcoming issue. Interest in the 2-D materials has grown significantly after scientists explored 2-D materials with groundbreaking results using graphene, and earning the Nobel Prize in Physics for 2010. "We are growing square inch single-, double-, and triple-layered WS2, MoS2 and others now," Terrones said. "By controlling the number of layers, we could control their optical electronic properties and therefore different types of devices become possible." 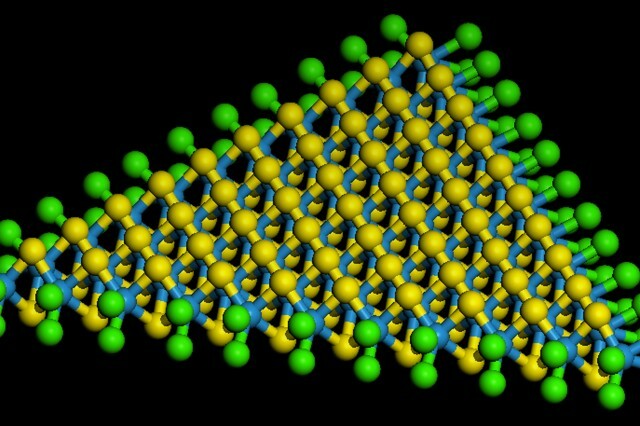 The Army wants materials that could help equip Soldiers with efficient technology at the lightest possible weight. In fact, ARL recently started a Director's Strategic Initiative, which is awarded based on its potential to result in emerging or alternative technologies, on Stacked 2-D Atomic Layered Materials. The primary investigator, Madan Dubey, Ph.D., was awarded the DSI to develop technologies to protect Soldiers and to design lighter-weight, energy-efficient electronic devices and batteries. ARL is developing 2-D-enabling technology for multifunctional transparent, high performance flexible/conformable electronics for future warriors. The research will enable creation of an unlimited number of material systems that will be unconstrained by conventional growth techniques, Dubey said. The Army will continue looking from many angles at "novel materials with extraordinary properties like 2-D WS2 that could benefit Soldiers into the future," Varanasi added.